Students at the University of Cape Town (UCT) are calling for the immediate release of the Fees Commission Report and a 0% fee increase for the 2018 academic year. 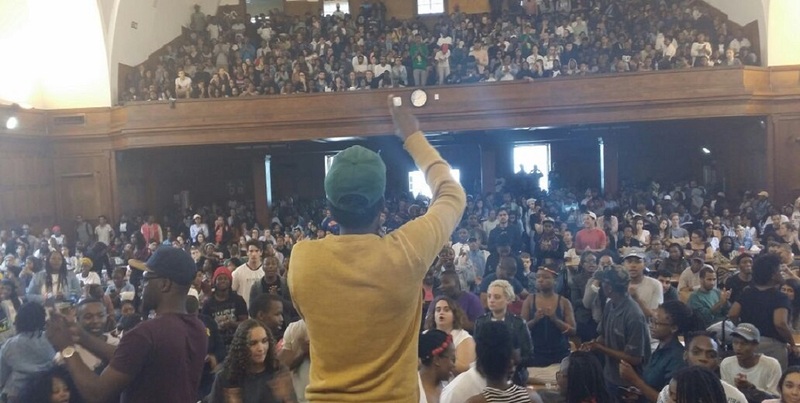 At a mass meeting on Tuesday, students planned to shut down the university. These, along with other demands, were set out at a mass meeting that the outgoing student representative council (SRC) held on Tuesday at the UCT Memorial Hall formerly known as Jameson Hall. The hall was filled to capacity and students were in high spirits. UCT spokesperson Elijah Moholola said UCT was aware that there were several disruptions on upper campus. â€œThe universityâ€™s Campus Protection Services is monitoring the situation,â€ he said. â€œUCT has not deployed any additional security on campus,â€ he told The Daily Vox. However, earlier on Tuesday, a picture was taken showing security presence on campus ahead of the announced mass meeting. At the mass meeting, students were outraged at a mooted fee increase of between eight and 10% for the 2018 year. SRC president Seipati Tshabalala broke down the university cost structure at the meeting then said students do not have the money to fund the costs of the university. This figure is from UCTâ€™s financial committee, this is the amount the institution needs to get rid of the deficit.â€œThat’s not our problem. We refuse to bear the brunt of the cost of this institution.â€ Tshabalala said. â€œUCT states unequivocally that there has been no decision taken on the 2018 tuition and residence fees,â€ Moholola said. The university has had many discussions with various stakeholders, including student representatives and staff. â€œAny figures mentioned during such discussions should not be seen as UCTâ€™s proposed fee increase for 2018,â€ he said. The student leaders said they stand in solidarity with students at Cape Peninsula University of Technology (CPUT) and the University of Free State (UFS) and are calling for a demilitarisation of both campuses. They also locate themselves in the broader call for free education. Students are also demanding a report on the expenses of security services on campus for the past two years, clearance of historical debt for 2017 and no financial barriers to registration for the next year. Students want a framework to address residence and housing, particularly for those who donâ€™t get residence offers. The students also want an emergency commission of inquiry into the suicides at the university that have occurred in the past two to five years. They believe institutional realities like financial exclusion, racism and sexual violence could be linked to student suicides. Workers were also represented at the mass meeting and spoke about their struggles. The students then moved around campus in attempt to shut the campus down. They handed over the list of demands to UCT Vice Chancellor Max Price at the Bremner building. As the march assembled outside Bremner building, Tshabalala announced that students would plan to march to Parliament on Wednesday to demand the release of the Fees Commission report. The details of the march would be decided at a meeting on Tuesday evening and would be communicated to the student body via email and social media. If the march goes ahead on Wednesday, it would coincide with Finance Minister Malusi Gigabaâ€™s first Medium Term Budget Policy Statement. The new higher education minister Hlengiwe Mkhize is expected to attend, as is President Jacob Zuma. After receiving the memorandum from the students, Price addressed the students. He said that the university had already complied with or supported most of the demands, such as the call for the Fees Commission report to be released. He said that the university expected the report to be released in September but it seems the reshuffle of the minister of higher education has delayed the release of the report. In an interview with City Press last week, the former higher education minister Blade Nzimande said that he had been removed from his position after Zuma had withheld the Fees Commission report from him. Regarding the deaths of students on campus, Price said that each of the deaths has been investigated by inquest and the universityâ€™s Mental Health Task Team is currently reviewing what has been done so far to support students. The task team will make recommendations for improvements. Addressing the studentsâ€™ request that he engage with the management of CPUT to demilitarise its campuses, Price refused to intervene, saying â€œI have to respect their leadership on their campusesâ€. Earlier on Tuesday, Moholola told The Daily Vox the UCT executive will engage with student representatives on the issues raised, however it urged students and student representatives to raise issues through the many channels available and not resort to disruptive actions that could jeopardise the 2017 academic year.